Coronado’s “dog beach” located at northern end of beach (next to Naval Air Station North Island). 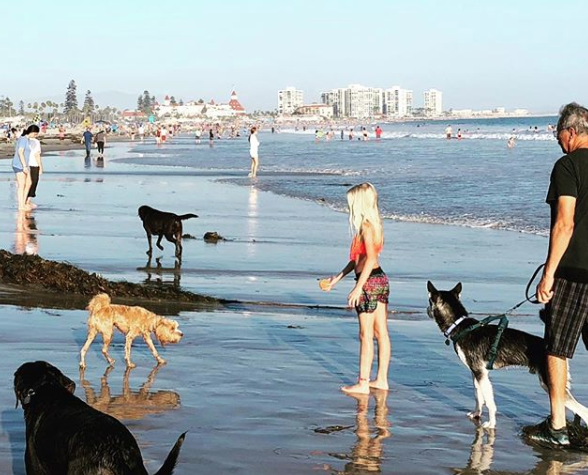 Coronado residents have long clamored for a leash-free, fenced-in dog park. Granted, they do have a “dog beach” at the north end of the public beach, and there is a leash-free dog park, unfenced, in the Cays. But village residents would like a grassy, run-free zone within walking distance. Vetter Park, often used by rogue dog owners who unclip leashes, is regularly patrolled by the police and closely scrutinized by the rule abiding neighbors. At Spreckels Park, it’s a definite no-no to even bring your leashed dog onto the grass area to toss the poop bag into a trash can, and Tidelands Park is under the jurisdiction of the Port of San Diego. 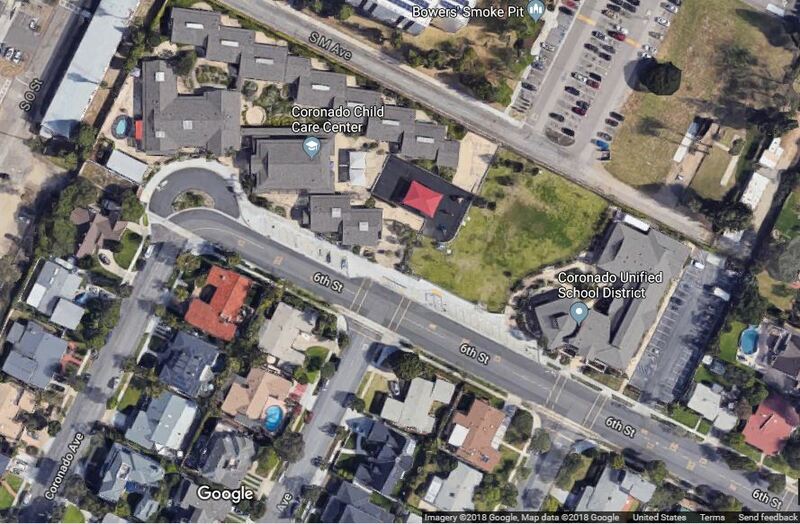 When the agenda for next week’s City Council meeting became available, many noticed an item on the Consent Calendar (items on Consent Calendar are “considered to be routine and will be acted upon with one motion”) for a dog park to be located next to the Coronado Unified School District (CUSD) offices on a ¼ acre of district property. City Council Agenda Consent Calendar item m.
* In October of 2016 the City of Coronado and CUSD signed an agreement (worth $370,000) to open some district facilities to the public. The current Facility Joint Use Agreement between CUSD and the City includes access by the public to the CHS track and field, the Village Elementary playground, and the CHS theater and conference rooms. Concerned residents, many proclaiming they are dog lovers themselves, expressed that there is already limited grass area on which the children at ECDC can run and play, and by dividing up the space the kids will literally be “running into each other.” Other worries included that it’s simply too close to the kindergarten. Kids might either be terrified by the dogs, or, kids might want to play with the dogs and stick their hands through a fence. Also, barking dogs will disrupt education. Many brought up health hazards of canine feces and urine and wondered who would pick up after irresponsible dog owners; would the city have to pay an employee to do it? Others said it would bring more traffic to the area, which is already often chaotic and congested during morning drop off and afternoon pick up times. And, what about strangers, and the general public hanging around so close to a school? Surely we don’t want to invite suspicious people to linger around our campus so close to our young children. A petition has been created on change.org to Keep the Grass Area for the Kids. Those in support of the fenced dog park chimed in as well. No one has all the answers or facts yet, but potentially the park could be open during non-school hours. It will have a double fence system so little hands can’t reach through to where the dogs roam. 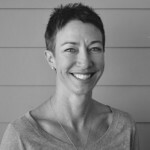 Do we really think that people from San Diego, after a long day at work, will make the trek over the bridge for Coronado’s tiny dog run, when there are numerous dog parks in San Diego? While children in Coronado can run and play in Spreckels, Tidelands, Vetter, Rotary, Sunset, Ferry Landing, and Mathewson parks, as well as a couple other small grass parks, the dogs have the sidewalks. The land is the school district’s property and they want to add it to the Joint Use Agreement to help the community, and in return receive financial support from the city. A second petition was created on ipetitions.com to Say Yes to a Dog Park One Year Trial. Maria Simon, CUSD Board President shared that once divided, the area would be separated by a double fence and that in addition to the regular playgrounds at the school, the students “will have unlimited access to the half of the park nearest the ECDC site (which also contains the largest shade producing trees).” She also explained that the entrance to the dog area will be from the district office side, furthest from the school. CUSD Superintendent Karl Mueller reached out via email to CUSD families. He explained that the current grass field is approximately ¾ of an acre. The dog area is planned as ¼ acre, leaving one half acre for the children. 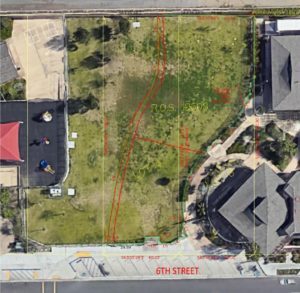 There is parking, fencing, and there are no residential homes on three of the four sides of the space, and the park is in an area of town that is not frequently visited by non-residents. When school is in session (180 days a year), the ECDC students use the park for recreational time during the school day and aftercare program. Students will still have access to a large, safe, grass play area. The proposal to expand the CUSD/City Facilities Use Agreement to include this property will increase existing City contributions to CUSD by $60,000 per year. In addition to the $60,000, if the City supports the design, construction, and ongoing on maintenance of the property, it will save the district an additional $50,000. City Council will meet at 4pm on Tuesday, August 21 at City Hall, 1825 Strand Way.